Ava is a Firebug which comes with its perks. She can set fires with her mind, keep things burning, and be all around badass. It also comes with its downsides though. Ava has to have her house enchanted to be fireproof, wear pants with special pockets, and she has to work for the Coterie, the magical mafia. The world building in Firebug was well thought out. You could tell that McBride had spent time constructing the setting and characters. The problem was everything was new to the reader and was packed in to the first 100 pages of the novel. It made the beginning feel very slow and I wished there hadn’t been so many flashbacks. I cared about Ava’s life pre-Coterie but not as much as I cared about what was going on in her present life. Despite the slow beginning I found myself liking Ava. Ava was a fiery character (pun completely intended) I liked her snappy, independent attitude and the fact that she was always willing to stand up for herself. Despite being basically enslaved to the magical mafia she did small acts of defiance and was willing to go toe to toe with Venus, the mob boss. At times though Ava did make dumb decisions or she didn’t pick up on basic social clues and that kind of bothered me. The best part about Firebug was the secondary characters. I adored Lock and Ezra, Ava’s mafia killing team/best friends. Lock is half-dyrad so he can do…well…tree-stuff and Ezra is a were-fox. I know this isn’t my usual cup of tea but these two characters sucked me in! Ezra especially was a scene stealer he was a bit of a player, a snappy dresser, and he was always good for a funny zinger. It was Ezra and Lock that kept me turning pages and it will be because of Ezra and Lock that I will read the sequel. 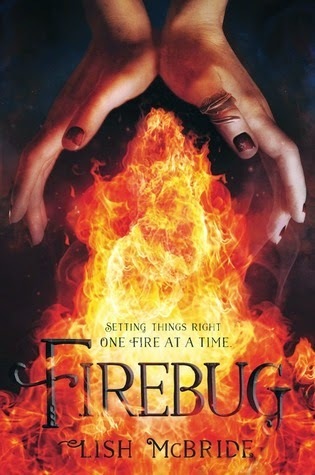 Overall, Firebug was a fun, funny, and interesting novel. It was definitely unlike anything else I’ve read in recent memory. I was drawn in to the world that McBride created. I have the first novel in her Necromancer series, Hold Me Closer Necromancer, and I can’t wait to start reading! I have such high hopes for Lock in the next book! I loved Ezra. Definitely my favorite character. I liked this book quite a bit.